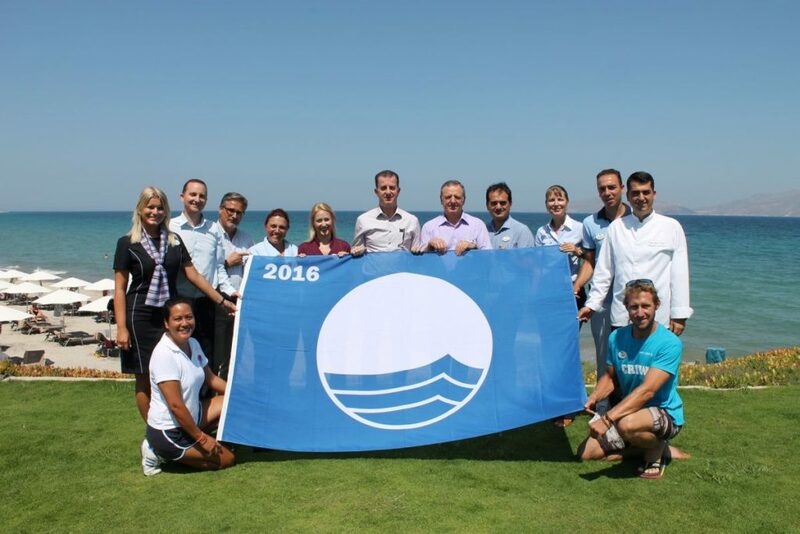 Neptune Hotels – Resort, Convention Center & Spa on the Greek island of Kos has been awarded with the international Blue Flag certification for the 14th year in a row. The Blue Flag is a voluntary eco-label awarded to more than 4,200 beaches, marinas and sustainable boating tourism operators in 49 countries across Europe, South Africa, Morocco, Tunisia, New Zealand, Brazil, Canada and the Caribbean. The eco-label works towards sustainable development of beaches and marinas through strict criteria dealing with water quality, environmental education and information, environmental management, safety and other services. Neptune Hotels is located on the northern coast of Kos right on the Blue Flag sandy beach and just 5km from the picturesque fishing town of Mastihari, 10 minutes by car from the international airport of Kos (8km), 18km from the island’s harbor and many other historic sights. The resort is very well known for offering high quality services to its guests in conjunction with the culture of traditional Greek hospitality. The Blue Flag Programme is owned and run by the non-government, non-profit organisation the Foundation for Environmental Education (FEE). The Hellenic Society for the Protection of Nature is the “Blue Flags” coordinator for Greece.